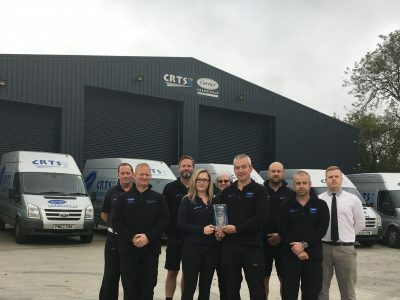 Bodmin-based network service partner Carrier Transicold Cornwall has won the 2018 Carrier Safe award for the first time, after demonstrating its commitment to Carrier Transicold’s stringent health and safety programme. Carrier Transicold, which operates in the UK as Carrier Transicold (UK) Limited, is a part of UTC Climate, Controls & Security, a unit of United Technologies Corp. (NYSE: UTX). The Carrier Safe programme was developed by Carrier Transicold UK in conjunction with the Engineering Employers Federation as a way of independently auditing environmental, health and safety (EH&S) standards across its network of UK-based service partners. Carrier Transicold introduced its most rigorous evaluation criteria in the 2017/18 assessment, measuring service partners against a 172-point checklist covering specific topics including EH&S legal protocols, and internal procedures and workshop inspections – now calculated using a traffic light system. Carrier Transicold Cornwall secured the award by achieving 167 green points – which indicates full compliance. Carrier Transicold Cornwall also received the Performance Assessment & Competitive Excellence (PACE) Recognition award for its continued commitment to delivering excellent customer service. The service partner recently invested in a new depot and is committed to continually developing the skills of its engineers. “To be honoured with a PACE award as well is fantastic, and we are very proud to have been recognised for the high service standards we provide to customers,” adds Edwards. Carrier Transicold UK’s service partner network is comprised of independent companies that provide support to customers operating Carrier Transicold equipment. The network collectively employs more than 160 mobile service engineers, supporting Carrier Transicold’s full range of light commercial vehicle, truck and trailer refrigeration equipment. Charlotte Edwards, Business Development Manager and Tim Edwards, Managing Director (centre) pictured with the Carrier Transicold Cornwall team. The network service partner has won the 2018 Carrier Safe award for the first time.